Russell Westbrook could return to the Thunder lineup as soon as Friday, with Kevin Durant rejoining the team not long after that, and it's none too soon for 3-12 OKC. Westbrook, recovering from a broken hand suffered in the Thunder's second game of the season on Oct. 30, is ahead of his rehab schedule. He was set for a reevaluation this coming Saturday, but has already returned to practice. 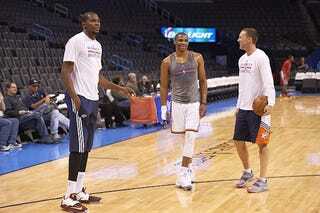 He was joined yesterday by Kevin Durant, who underwent surgery on Oct. 16 to repair a fracture in his foot. Westbrook's closer to a return—Oklahoma City coach Scott Brooks wouldn't rule out Friday against the Knicks—but even Durant took part in most contact drills yesterday. "They looked good," Brooks said. "But no more than that. "They're going to continue to go through this process, and when they're ready, 100 percent ready, they will play. But until then, nothing else we know of." The Thunder have injury issues that go well beyond Westbrook and Durant, though getting back better than 50 percent of their usual scoring output isn't going to hurt. The jayvee Thunder stayed afloat as best they could—not very well—but with the season nearly a fifth of the way through, it's definitely time to start kicking back to the surface.